Sheep, Brown Bear, Moose, Caribou, Grizzly Bear, Black Bear, Wolf. Mule Deer, Elk, Cougar, Bobcat, and Moose in Southeast Idaho. Whitetail, Mule Deer, Turkey, Black Bear in central Idaho, Clearwater Drainage. Elk, Mule Deer, Black Bear, Cougar, Moose, Bobcat. Central Idaho (Areas 15, 16A, 19, 20). Whitetail and Elk hunting in Northern Idaho, Clearwater Drainage in Bitterroot Mountains. Elk, Black Bear, Mountain Lion. Northern Idaho, Lolo zone in Locsha and Selway-Biterroot Wilderness Area. Mountain Lion, Black Bear. In North Central Idaho. 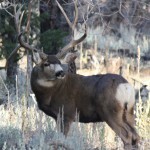 Quality trophy hunts for Mule Deer, Elk, Mtn. Lion, Black Bear, Antelope and more. We have one of the highest success rates for Fair Chase Hunting! Looking for Elk city adventures to Archery Bow Hunt. 5 days. Hunting the Sawtooth Wildernes at its finest. We provide drop camps and guided hunts for trophy Rocky Mountain Elk and Mule Deer. We have baited bear hunts, hound bear hunts, and cougar hunts. Visit our website for details. Stay far far away from Randy Parks or Centennial Trails Outiftter. We offer September RIFLE HUNTS DURING THE RUT. MULE DEER LEASE 2500 ACRES UNIT 73 100% DRAW. Idaho hunting outfitters and guides for Elk, Mule Deer, Mountain Lion, Wolf, and Black Bear. If you are a Idaho Hunting Guides and would like your service listed here, use our Submission Form. It's Free!